You’re not the office-job kind of person and you hate the 9 – 5 life, right? That’s totally why you’re here right now looking a way to make some money from blogging so that you can break free from that boring lifestyle. I’m the exact same way. I love working online because it gives me the freedom to choose my own work hours and work location. I also get to spend more time with my friends and family which is super important to me. 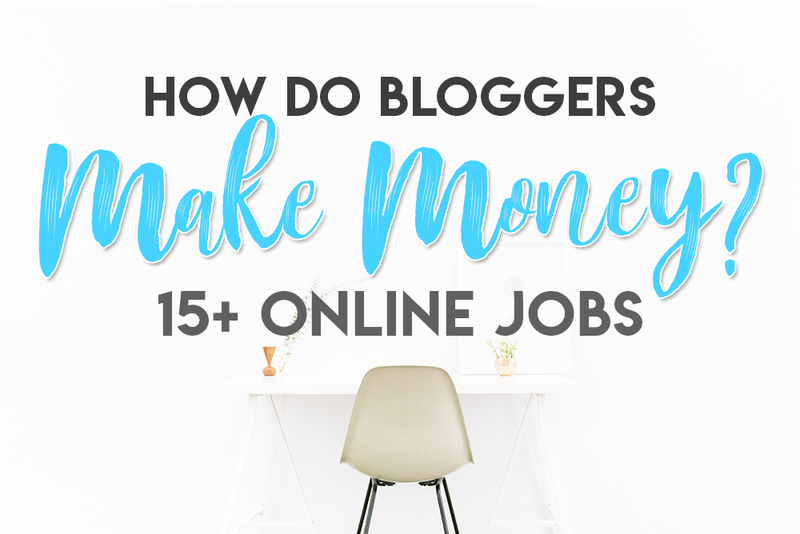 So, with that being said, a question you might be wondering is “how do bloggers make money blogging?” It’s a question a lot of people wonder because there’s no doubt that successful bloggers are earning full-time incomes from their blogs. What’s more is that the blog income they earn allow them to work anywhere they want, choose their own work hours, and do what they love — every. single. day. You also have the opportunity to create a blog that’s just as successful! Before we get down to the good stuff, let’s get you a few other answers first because it’s important that you set up the right foundation of your money-making blog. 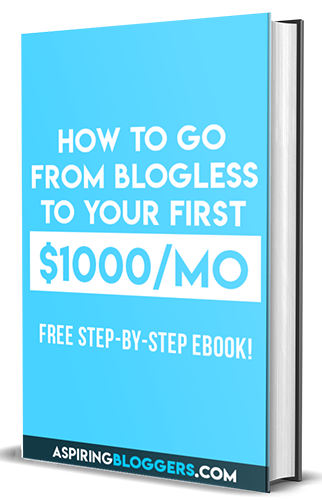 Popular bloggers earn 5, 6, and even 7-figure incomes from running their blogs. It depends on the blogger. Try doing a quick Google search for “blog income reports” to find posts where bloggers reveal what they make. It’s exciting to hear this information but don’t let it get to you! It’s so easy to get caught up in the thought of turning your blog into a full-time career. I mean, who wouldn’t want to get paid to blog about something they love? However, when you first start out, you might just make enough to cover your blogging expenses. As you continue to blog, you’ll notice your blog income growing higher and higher. It’ll definitely take time. The amount of blog income you’ll make really depends on how much time and commitment you spend on turning your blog into profitable source of income. The harder you work and the more income streams you have, the higher your blog earnings will be. The dream of blogging full-time doesn’t have to be as far of a reach as you think! Let’s cut to the chase. I like to think that all good things in life are earned. Some people will trick you and tell you that it’s easy to make money blogging but in reality, it’s not. I won’t tell you that it is. To get paid to blog part-time or even full-time, it’ll require a lot of hard work, research, and patience. You need to treat your blog like a business! Some people will never reach their blog income goals and it’s really because they give up too easily. They don’t correct their mistakes and they stop when they run into obstacles. If you stay focused and overcome challenges, you’ll succeed. If you have these three prerequisites, you’ll maximize the earnings on your blog! Trust me. Most successful blogs have these three things. From a marketing perspective, a great reputation usually sells itself. This is where we get into a little more about branding. People love buying products from brands they trust and can rely on. Your blog is essentially your own personal brand. It takes time to build trust and you can do it by writing high-quality blog articles that solve problems for your readers and by interacting with your audience. A stronger reputation means people will be more likely to buy your products, services, and even purchase the products you recommend. Many people seem to think that high traffic blogs generate more money but that isn’t always the case. You can make money blogging with low traffic or high traffic on your blog. The type of traffic you get is what determines how much income you make on your blog. What matters the most is if your readers are ready to buy. When you feature products on your site, your customers will also go through this mental process. 100 visitors who are ready to buy will make you more blog income than 10,000 visitors who just came to your blog to find information. Make sure you target the right audiences with your articles. It will surely get you traffic that actually contributes to an increase in your blog income. Every amazing blog needs to be paired with amazing products. If your products don’t serve your audience, it’s very likely that they won’t purchase and you won’t make any money from blogging. You should always offer high-quality products that are valuable to your audience. Learn more about how to build a good reputation, get blog traffic, and find great products here. Now that you know all the prerequisites of a money-making blog, let’s move on to how to actually make money blogging. Your niche is a very important factor in determining whether or not you’ll get paid to blog. Some niches have very small audiences and little to no traffic. You probably don’t want to choose one of those niches if you plan on making money from blogging. You also may want to consider a niche that’s not extremely competitive either. 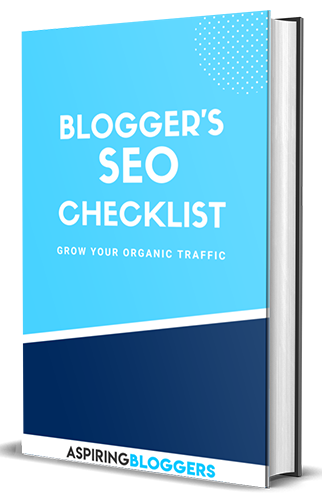 There are just too many bloggers for them and it might be hard to make a sale or get your blog noticed in such a big pool of bloggers. Not sure what to blog about or what type of blogs make the most money? Check out our article on 100+ profitable blog niches to learn about the different types of blogs niches that make money. It’s easy to think about starting a blog, but actually doing it is what really matters. There’s no real reason to hesitate on starting your blog. In fact, there are more reasons why you should start a blog! You might not know what you’re doing but none of today’s successful bloggers knew what the heck they were doing when they first started their blogs either so that’s no excuse. The only difference between them and you is they started a blog and you didn’t and now they’re making money blogging while you’re not. Stop slacking and get started on your blog right now! Hire us to create one for you or learn how to create one your self with our detailed guide on how to start a profitable WordPress blog. It’s good practice to research and find topics that people care a lot about (but make sure they’re relevant to your blog niche!) These topics will help you generate high traffic to your blog and provide you with the opportunity to convert them into customers. Quality and relevant readers = More blog income. Ka-ching! Google, being the biggest search engine on the planet, knows what people are searching for and which topics are trending. You can use Google Trends to identify trending topics and then write content around those topics! Quora is a popular website where questions are asked and answered by its users. You can utilize Quora to find out which questions are being asked the most and then create content that answers those questions. An easy way to find problems to solve for your readers. Blogging allows you to learn more about marketing and eventually become an expert at it! There are endless ways you can choose to promote your blog with. You can be as creative as you want when coming up with a marketing strategy that works well for your blog. As mentioned earlier in this post, an awesome reputation is required to make money blogging and you can do it through writing great content and interacting with your readers. We’ve already covered the great content part in #3 so let’s talk about audience interaction. Interacting with your readers allows them to get to know you better and sets them up for future sales. Little by little, you want to help your audience understand what kind of person you are, what your intentions are, and how you’re valuable to them. Start by getting involved with different social media platforms like Facebook and Twitter. Facebook allows you to create a page or group for your blog and start gaining a follower base. You can interact with your readers here by asking questions, sharing helpful articles that you wrote or that you found externally, and replying to messages they send you. Twitter is excellent for finding conversations to be a part of by searching for hashtags containing keywords that are related to your blog. You can also create your own conversations, promote your blog posts, and show your personality all within this platform. You’ll receive comments on your blog articles every now and then and you want to reply to them as soon as possible! Don’t just say “thanks for the comment!” Add more depth to your replies by creating a conversation. Who knows? You might even gain a new relationship out of it. Within your blog posts, you also want to entice your readers to leave a comment after reading your post. This will improve the chances of someone interacting with you. Newsletters are great of keeping in touch with readers who sign up! You can send them your latest blog posts, ask them a question, or even promote your latest products or services for more blog income. There are so many opportunities for online jobs and you’re probably qualified for many of them right off the bat! How to make money blogging as an affiliate marketer? Affiliate marketing is the process of promoting another brand’s products through affiliate links — links provided by the brand that give you a commission when you help make a sale. There are tens of thousands of products you can become an affiliate for! You can check out shareasale.com to create an account and start becoming an affiliate. After you get some affiliate links, you can promote your links anywhere on your blog! Try implementing them inside your blog posts, on your sidebar, in your footer, or even as a link in your menu bar. How to make money blogging as a product marketer? You can sell physical products which are products that can be shipped to your customers. It can be your own product or a product you buy and flip for more money. If you have an amazing product that you want to sell to your readers, I say GO FOR IT! You never know if it’ll work until you try selling it. If you want to offer products or services on your blog, you’ll need to learn how to create a store for your blog. 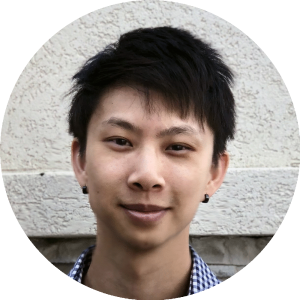 I would recommend you to start with WooCommerce. Digital products are products your customers can download after they pay. This includes things like eBooks, printables, design templates, stock photography, and online courses. 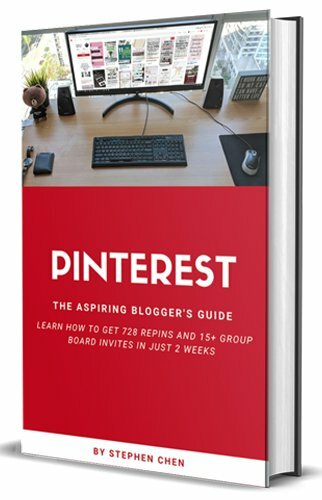 An example of a digital product: Pinterest Strategies by Carly from mommyonpurpose.com where she shows you the strategy she uses to generate over 200,000 page views per month on her blog! How to make money blogging as an online consultant? Consulting is among one of the many online services you can offer your readers and there’s usually something you can coach for every blog niche! If you know a lot about a particular topic, you can use your reputation to earn business. An example of a consulting service is marketing consulting, where you help clients figure out what their problems are, and giving them the answers they need to fix the problems — making your clients more successful at promoting. You can choose to charge your clients whatever you feel your time is worth, giving you complete control over your earnings. I recommend starting with lower prices when you begin and then gradually increase your prices as your reputation and number of clients increase. This will help you maximize the revenue you receive from consulting services. Use the WooCommerce tutorial above to sell services on your blog the same way you would sell products. How to make money blogging as an online coach? Online coaches are very similar to online consultants except you’re not the one finding the problem and providing the answer. Instead, you’re helping your clients build on their strengths to a point where they can learn to come up with solutions themselves. An example for online coaching is a fitness coaching, where you help your clients develop the capability to manage their own fitness and become fit themselves. You can also charge what you think you’re worth as a coach! How to make money blogging as an ads promoter? As a ads promoter, your job is just to blog, produce high-quality content, and then promote it to generate as much traffic as possible! Then you can start making a big-time income through ads networks. High traffic blogs can make a lot of money through ad revenue. If your blog has low traffic, it’s probably not worth it as ads don’t provide the most user-friendly experience. How to make money blogging as a membership site manager? As a membership collector, you’ll be responsible for running a site that offers membership services! A Membership program will allow you to charge your subscribers a monthly or annual fee. You could implement a membership program on your blog if you offer super valuable information that is unique and that people don’t usually have access to for free. You might’ve noticed that recently news websites like thewashingpost.com have been charging people $1 per month for access to their news articles. Another example is PHLEARN.com where people can subscribe for $8.25 and have access to their database of Photoshop tutorials. How to make money blogging as an influencer? When you get to the point where you become a successful blogger (lots of web traffic, social media followers, and email subscribers), you can become an influencer in your niche. Influencers are really good at influencing people to make decisions which includes buying products from various brands. If you get noticed by a relevant brand, they’ll reach out to you and pay you to help promote their products! Alternatively, you could create a media kit and reach out to the brands of your choice. The amount of money you make will depend on the brand partnerships you’re involved in and your popularity. Some pay extremely well! How to make money blogging as a virtual assistant? A VA (virtual assistant) assists another person with managing their day to day activities, whether it be monitoring their social media accounts, replying to emails, creating graphics, or anything else digital, you’ll get paid to help make their lives easier. You can easily become a virtual assistance if you can show quantifiable proof that you’re great at managing digital activities. Then it’s your job to reach out to bloggers who are VAs! VA jobs are usually salary or hourly based. Your compensation will depend on your experience and your value to the individual. You could even be a VA for multiple clients at once! How to make money blogging as a freelance content writer? After blogging for a while, you’ll probably develop a knack for writing, so why not write for others and get paid to do it? Other domain owners love hiring qualified people to write for their sites because it brings writing diversity and it helps save them time. You can find freelance writing jobs with a quick Google search of “Freelance writing for ______” and then fill in the blank with your niche. Best of all, sometimes the domain owners let you leave backlinks back to your own site! So you end up getting paid, and you get all the link juice that comes with the backlink. The compensation for freelance content writers really depends on the domain owner of which you’re working for. Usually you’ll get paid per article, per length of the article, or by the hour. Much like an ads promoter, you’re also promoting ads as a direct ads promoter, except you’re partnering directly with businesses and renting out space on your blog specifically for their ads instead of going through ads networks (like Google Adsense) where ads are random. The cool thing about this kind of ad promotion is that you get to choose what ads you display on your site! You can work with companies you choose. To be able to do this, your blog must have BIG numbers when it comes to site traffic. If you don’t have high numbers, businesses won’t partner with you because it won’t be a good return on investment for them. As a direct ads promoter, you can charge a flat monthly fee for as long as the business chooses to partner with you. The higher your traffic, the higher the fee you can charge for renting out ad space. How to make money blogging as an SEO Specialist? All bloggers need to deal with SEO (search engine optimization) if they want high organic traffic from search engines. When you practice the implementation of SEO on your blog enough, you’ll eventually become an SEO specialist and be able to help others with their SEO! SEO services can include site audits, keyword researching, website optimization, content optimization, and backlink generation. SEO services are usually very expensive because of the level of importance it has for websites. Businesses pay really well for SEO services, and some individuals will be willing to pay as well (just not nearly as high as businesses). How to make money blogging as a social media account manager? Social media is essential for all bloggers to reach out to different audiences and engage with them. Over time your social media accounts will grow. If you have a high follower count on any social media platform, you can consider yourself an expert! People will pay you to help manage their accounts because they struggle to manage and grow them themselves. You can charge a monthly fee to manage these accounts. How to make money blogging as a graphic designer? To make your blog stand out, you might come across some graphic design experience yourself. Heck, you might even have become a PhotoShop, Illustrator, or Canva expert! I know I wasn’t the best graphic designer when I first started with Photoshop, but now I surprise myself with the designs I make! Some people aren’t creative enough to create their own graphics and will hire externally. Use this opportunity to offer your design services and charge per design. How to make money blogging as a content strategist? Content strategists are really good at coming up with new content that appeals to specific target audiences. The more you blog, the more you’ll know what your target audience wants. Some people aren’t very good at coming up with new posts for their blog or their social media channels. You can help other people with their content which will end up boosting their traffic and engagement — something that’s worth the money spent. As a content strategist, you can charge per service! 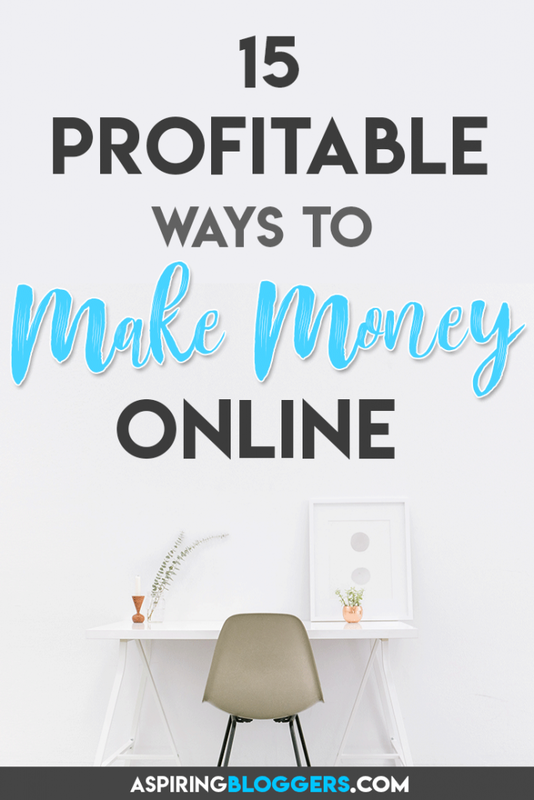 Now that you have a complete understanding of how to monetize your blog, it’s time to implement these strategies! Leave a comment below and tell us which monetization methods you’re going to use on your blog. Also, be sure to share this with your network to show others how to get paid to blog! If there’s anything we missed, send us a message and we’ll be sure to update our article. Our threshold to work with a site is 25k sessions in the last 30 days and we’re here to answer any questions at [email protected]. Thanks for the mentioning my article Stephen! I’ve pinned this awesome post for my followers to refer to.